My name is Sue and I have a small TICA registered cattery in the beautiful Bluegrass area of Kentucky. I have been working with savannah cats for over 18 years, and the savannah cat breed has captivated my heart! Savannah cats are truly loving animals, and my goal is to produce kittens as close to their wild ancestors in type and size, but with a wonderful domestic temperament. 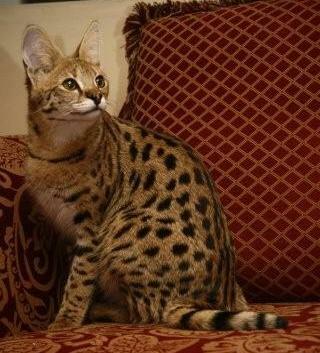 I only breed Savannah to Savannah and/or Savannah cat to serval. All adults have been tested neg for FeLV/FIV and are all PK Def N/N and PRA N/N. All babies are guaranteed to be fully spoiled before they leave my house.
" A Breeder (with a capital B) is one who thirsts for knowledge and never really knows it all, one who wrestles with decisions of conscience, convenience, and commitment. One that shares this knowledge and guides those interested.
" A Breeder is one who sacrifices personal interests, finances, time, friendships, fancy furniture, and deep pile carpeting! She gives up the dreams of a long luxurious cruise in favor of turning that all important litter into this year's" vacation".
" The Breeder goes without sleep in hours spent planning a breeding or watching anxiously over the birth process, and afterwards, over every little wiggle or cry.
" The Breeder skips dinner parties because that litter is due or the babies have to be fed at eight. She disregards birth fluids and puts mouth to mouth, to save a gasping newborn, literally blowing life into a tiny helpless creature that may be the culmination of a lifetime of dreams.
" A Breeder's lap is a marvelous place where kittens of proud and noble heritage often snooze.
" A Breeder's hands are strong and firm and often soiled, but ever so gentle and sensitive to the thrusts of a kittens wet nose.
" A Breeder's back and knees are usually arthritic from bending and sitting with the mother due, but are strong enough to guide that new little kitten to maturity.
" A Breeder's shoulders are often heaped with responsibility, but they're wide enough to support the weight of a thousand defeats and frustrations.
" A Breeder's arms are always able to wield a mop, support an armful of kittens, or lend a helping hand to a newcomer.
" A Breeder's ears are wondrous things, sometimes red (from being talked about), or strangely shaped (from being pressed against a phone receiver). Often deaf to criticism, yet always fine tuned to the cry of an anxious kitten.
" A Breeder's brain is foggy on faces, but can recall pedigrees faster than an IBM computer.
" The Breeder's heart is often broken, but it beats strongly with hope everlasting.......and it's always in the right place! Oh, yes, there are breeders, and then, there are Breeders!! !